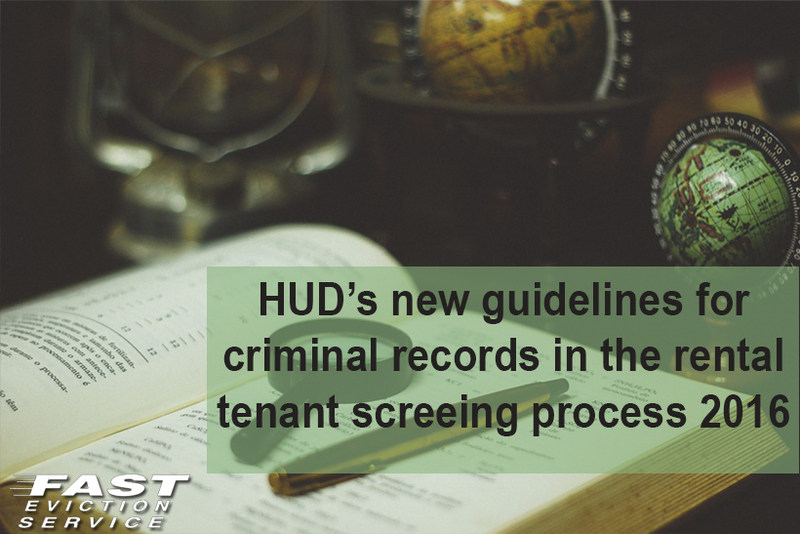 HUD’s new guidelines for criminal records in the rental tenant screening process 2016. On April 4, 2016 the Department of Housing and Urban Development (HUD) released a 10 page guide on new rental tenant screening laws and regulations titled “Guidance of Application of Fair Housing Act Standards to the use of Criminal Records by Providers of Housing and Real-Estate Related Transactions.” This new guide could possibly mean disaster to many landlords and managers of rental properties as it basically changes the rules we all know regarding the rejection of an tenant applicant due to their criminal history. Below is a summary of the guide, but I suggest you the landlord and property manager read the guide a few times over, as it is a very important change to the tenant screening rules and laws, and a change that is here to stay. Just because you see the word “HUD” many landlords think it has something to do with only those who are involved with federally subsidized housing or public housing. In this case, every single landlord and property manager is subject to the new guidelines. All housing providers must study up and follow the new rules regarding legal rental tenant screening or face possible discrimination allegations. HUD is a federal entity that investigates all fair housing violations, including discrimination, that involves all landlords in general, not just Section 8 properties. Like the sub titles says, no one is exempt from these new legal guidelines. Before we continue analyzing the new guidelines, it’s important that we understand “disparate impact.” What this means is that a land lord can have a basic neutral screening policy for all applicants no matter race, ethnicity or criminal history, but it can still be discriminatory if the policy results in a disproportionate impact on an applicant of a protected class or group of people. To get more in depth, the guide uses a lot of statistics that show minorities across the United States get arrested and convicted at rates that are disproportionate to their percentage in the general population. The guide then goes on to infer that because of these stats, in the case where a landlord considers the applicants criminal history as part of the screening process, they may be discriminating against certain races and or national origin which are both protected classes under the Fair Housing Laws. So in short, the landlord thinks he’s being fair by including every single applicant equally in their screening process, but may not know he/she is discriminating on a rental tenant applicant based on their race or national origin because your policy affects minorities more than others. A landlord must be able to prove through reliable evidence that his/her policy or practice of tenant screening based on criminal history actually assists I protecting resident safety and/or property. Merely relying on generalizations or stereotypes that anyone with a criminal history poses a greater risk than a person without such a background is not sufficient. One of the more disturbing details about this guide is their view on prior arrests in the tenant screening process. Prior arrests that have not resulted in a conviction to be a little more specific. If your tenant screening policy states that prior arrests will disqualify you from the process, according to HUD, this doesn’t meet the burden of having a “substantial, legitimate, nondiscriminatory interest.” In plain English, if you use this policy, stop it now. You are discriminating in your tenant screening process. What? If you’re like me and many other professionals, the first thing that popped in my head was: okay, what about pending criminal cases? HUD doesn’t come out and say it, but we have to assume that we’re not allowed to deny an applicant because they have been arrested recently and still have a pending criminal investigation, since under their regulation, there has yet to be a conviction. Let’s put this in perspective. I have a single mother tenant of 16 years who has two beautiful young daughters. HUD is telling me that I have to consider renting the next door vacant apartment to a middle aged someone who has a pending “sexual assault of a child” case? What about the convicted ones? HUD goes on to say that you will be unable “meet this burden” if you impose a general policy to reject any rental tenant applicant with a conviction record. No matter when the conviction occurred, what the conduct entailed, or what the person has done since then. In other words, you cannot deny anyone because they have a criminal conviction on their record, and if you, you are violating Fair Housing laws and because of this, discriminating based on race or national origin. The amount of time that has passed since the criminal conduct occurred. If the landlord is to set criteria for rejecting any applicant for the sole reason of having a prior criminal conviction record, HUD recommends they fall under the previously mentioned. The new HUD guide does in fact state, and makes it very clear, that there will be no tolerance for convictions for illegally manufacturing or distributing a controlled substance as defined in section 102 of the Controlled Substances Act (21 USC 802). The landlord is still free to automatically reject any one for having a prior conviction under these circumstances. I strongly believe at the end of the day, even with HUD’s massive effort to try and keep the playing field fair for everyone, landlords will find a way to avoid this tenant screening laws mess all together. What some experts and professionals are frustrated about with this new tenant screening guide is the fact that HUD for years has been preaching equality and fairness for all, and now it seems they want to landlords to view each applicant on an individual basis. The fact of the matter is that not everyone has the time of day to review every single case. I can imagine a landlord that manages over 30 applications a day for over 200 rental units having to go downtown to the courthouse to review details of their conviction case to determine whether or not this applicant has been rehabilitated or not. Would that make landlords social workers or therapists? Landlords must now decide and take into heavy consideration whether they want to provide a peaceful rental community, or risk being investigated and sued for violating these new rental tenant screening laws and regulations.